Even without coffee, my ears perked right up. The report, by journalist Jacki Lyden, took an inside look at a company of jousters who do the “touring circuit” of several Renaissance Faires throughout the country every year, and both the dangers and rewards they face in preparing for, and putting on their shows. The piece touched on several aspects of the values of chivalry – how the sense of honor that permeates this sport appeals to audiences who “spend their days sitting in a cubicle” and “want to escape the everyday mundane grind”; and also the degree of trust and respect this competitive sport builds among its participants. 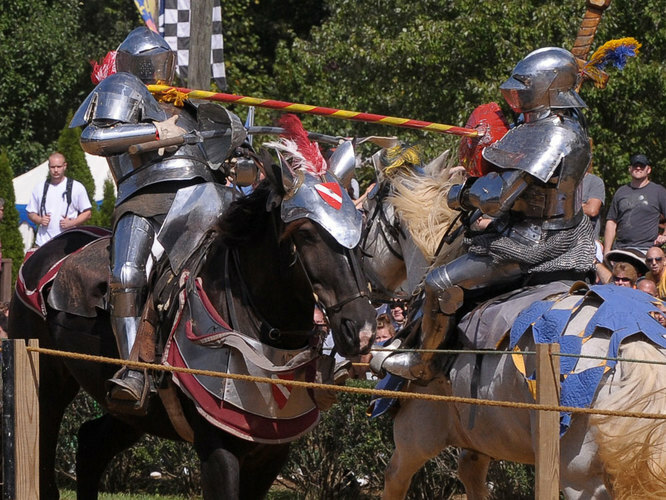 Unfortunately, the story left the concept of chivalry within the confines of the Renaissance Faire – the reporter didn’t explore whether the jousters or the spectators took away any sort of lasting ideals or different impression of a code of honor when the show was over. Still, the report (free of the usual hokey pirate language and lame puns – they even resisted the urge to call the piece “Living the Knight Life”) left listeners with the impression that there is something serious – even respectable – to be found among the athletes and performers who put on modern day jousting shows.